We’re halfway through series four of The Great British Bake Off already! The halfway point this year was biscuit week. Which sounds deceptively easy, but, of course, it wasn’t. The first challenge for the bakers was to make their favourite traybake. This could be anything they wanted, from brownies to blondies, and flapjacks to cakes. The judges requested that they were of an identical size, and all ingredients must be made from scratch. The bakers got the rulers out to ensure identical sizes and Glenn made his own marshmallow for his Apricot & Pistachio Tiffin traybake. 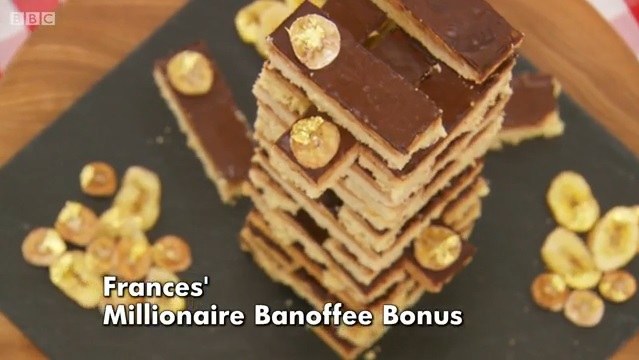 I loved Frances’ idea of combining a Millionaire’s Shortbread with Banoffee flavours – genius! 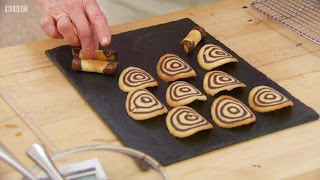 Of course she also made the biscuits look like a game of Jenga… The judges finally gave her the thumbs up for substance! Kimberley and Christine did well in this challenge, both receiving entirely positive comments. 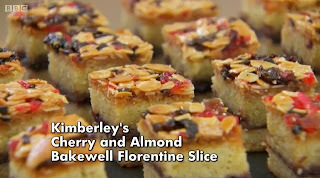 Rob’s Blueberry & Orange traybake was under baked, and the judges thought Howard’s Breakfast Flapjack was too stodgy. Beca had mixed reviews, her Hazelnut, Cherry & Chocolate Brownies looked good, but were under baked. Ruby had a similar problem, the judges loved the flavours of her Lemon & Blackberry Bakewell Slice, but her pastry had a soggy bottom. Mary described this week’s technical challenge as “exceedingly difficult”. The baker’s were asked to make 18 Tuiles – very thin French biscuits. 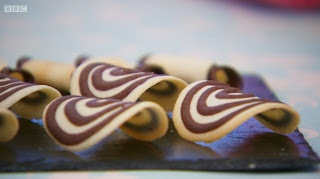 Half were to be shaped in a curve and chocolate circles piped into them, and the other half were to be wrapped like cigars and dipped in chocolate on either end. A hefty request! Oh, and they only had 90 minutes to do this! The bakers struggled with getting the right thinness for the biscuit, piping the chocolate as no piping bag was provided (I thought this was a step too far, surely half the instructions is cruel enough?!) They are really not a fan of shortcuts on GBBO, despite Mary saying she likes to use them where possible. Then the baker’s had to shape the hot biscuits straight from the oven – ouch. Christine won the challenge (her winning Tuiles pictured above), with Glenn in second and Frances in third. Howard came last with Ruby and Kimberley not far behind. 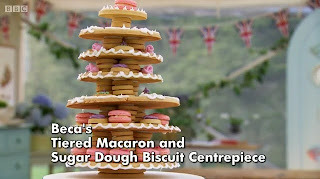 The final showstopper challenge was to make a biscuit tower that was at least 30cm high. The bakers had to not only impress with their textures and flavours in this challenge, but also with their architectural ability to make their towers structurally sound. This meant that the texture of their biscuits would be crucial to the stability of their tower. I loved the moment between Beca and Glenn where she gave him a tip for his tower, it was really sweet and shows how much these people really are friends first, and competitors second. 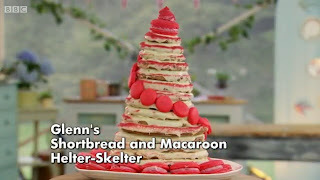 The judges really liked Glenn’s Helter Skelter Tower and labelled his macarons ‘exceptional’. I didn’t know if Beca’s tower would stay up as it looked quite wobbly, but it turned out beautifully! Sadly for Frances, her biscuit tower collapsed, despite Mel’s attempts to stabilise it, it was not constructed well enough to hold. I was surprised by this after the Jenga biscuit tower she made earlier. 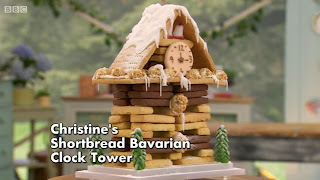 Christine made a fabulous Shortbread Clock Tower, which had a strong structure and Paul and Mary loved it. I was disappointed to see Kimberley not do well here as she is one of my favourite contestants. She made a Viennese Biscuit Tower which was too weak. Rob made a Dalek! So awesome, I don’t even watch Doctor Who, but I thought this was a great idea and very individual. Christine received a well deserved star baker for the second time. I think she could be in the final three! 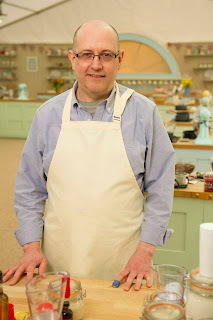 Rob left this week, I thought he was an incredibly lovely and sweet man, but unfortunately his bakes were lacking in recent episodes. He said he was happy to have done the three things he wanted – won a technical challenge, got star baker, and made it halfway. Next week the bakers will be making sweet doughs, such as sweet buns and Paul Hollywood’s Apricot Couronne. I decided to make Millionaire’s Shortbread this week after being inspired by Frances’ traybake. I’ve never made it before so I decided to just make the regular kind, but now I have the basics down, there’s plenty of flavour combination ideas in my head for future experimentations! I lined a square tin with greaseproof paper. My tin is 21cm square, a 20cm square tin will also work fine. I started by making the shortbread. I put 200g plain flour, 175g butter and 100g caster sugar into a bowl and rubbed it together with my fingers until it resembled breadcrumds. I poured it into the tin, and pressed it down until it was compact. I baked on160C/325F/Gas Mark 3 for 40 minutes, then left it to cool. To speed up the cooling I put an ice bath underneath it. I used a cooling rack to balance the tin above the ice water. To make the caramel I first melted 50g butter and 50g light brown sugar over a medium heat. I added a full can of condensed milk (397g) and turned the heat up so it would boil, stirring constantly. Once it boiled, I let it simmer for 5 minutes and stirred constantly. Never stop stirring! The caramel will thicken noticeably and darken slightly. I left the caramel to cool over the ice bath. I was happy to see it set and become nice and firm. I melted 200g dark chocolate and poured it over the set caramel, I smoothed it out and left it to set. Once it was set I removed the shortbread from the tin and removed the greaseproof paper. Cutting it was quite difficult. My first few slices cracked the chocolate on top. So I heated the blade of the knife with hot water and gently pressed it down onto the chocolate. Once the blade had melted through the chocolate, I pushed down to cut the caramel and shortbread. This did mean that the caramel layer was covered in chocolate residue, but I couldn’t see any other way around this. Oh my these were tasty! The caramel is extremely sweet, but delicious! The chocolate and biscuit balance it out perfectly, the combination of layers is superb. They aren’t the neatest Millionaire’s Shortbreads in the world, but I do like my bakes to have a home made look to them. Waiting for the layers to set makes this a time consuming bake (although you can wonder off and do other things whilst each layer cools/sets). Overall it is easy to make and I can’t wait to try it again and add some other flavours! They made such lovley traybakes! your millionaires look lovley…i had always wondered about them but imagined they would stuck in my tin. Thank you! Thanks to plenty of greaseproof paper I didn't have any problems with them sticking to the tin! I love Millionaire's shortbread Kat. Your step by step guide makes it nice 'n' easy. Thanks Stuart! It was so yummy… I may have had a few squares! That's a great write up, thank you. 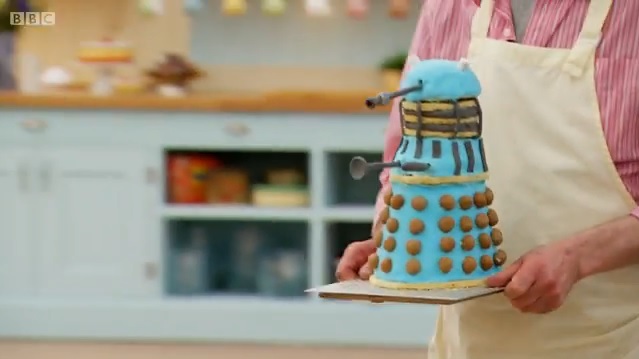 It's good to be reminded of all those amazing bakes, it's amazing how quickly I couldn't remember what they made. 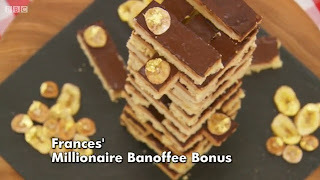 I've never made millionaires shortbread before, must try it one day. Yours looks good. Thank you! I know you forget so quickly, doing this helpes me remember too. I highly recommend trying this as it is easy to make and so delicious!